I don’t do Christmas. I don’t have any family here and so it seems kind of pointless but it seems that Christmas does me! And all my Christmases came at once, as they say, this month when four packages were waiting for me at the post office this week on top of a couple that I had received the week before. Two were purchases that I had made some time around Christmas and the rest were gifts. One was from Argentina, another from Morocco via Australia, one from Bangladesh, one from Sweden, one from the UK, one from India and yet another from Australia. Luckily, I now have space for all this new stuff! I can’t decide which one produced the biggest smile. 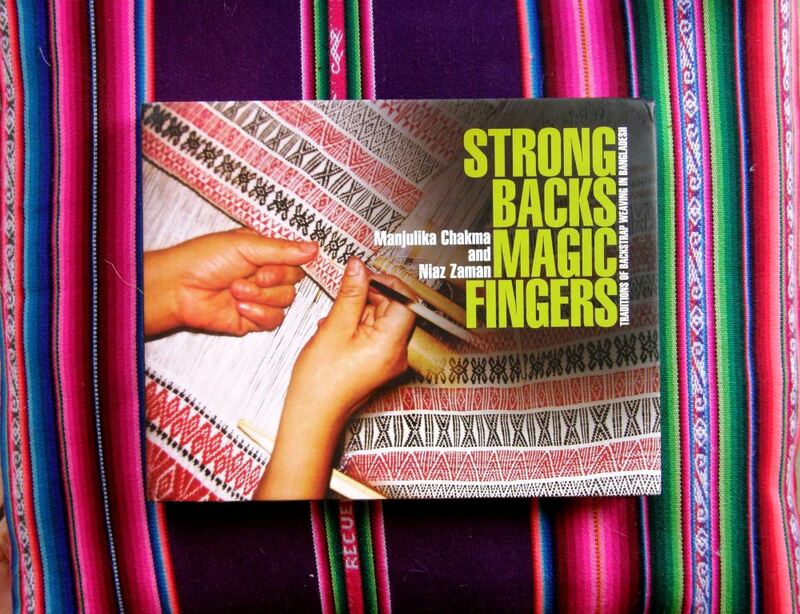 Let’s start with the book from Bangladesh on backstrap weaving. I suppose this is the one about which I feel most triumphant. I have been trying to get this book since the middle of 2010 when I ran across a newspaper article about it online. Letters to the publisher didn’t produce any response. I tracked down an Australian journalist who had written a review on it but she couldn’t help. I asked my Godmother in India to try through some friends of hers in Bangladesh…no luck there either. I met a teacher from Spain on Ravelry who is working in Bangladesh who offered to try and get it…she couldn’t manage it… and finally, a Facebook acquaintance, Ananda, who works as a fashion designer in Bangladesh, came through. He had heard of one of the authors, Manjulika Chakma and seen the book at a book fair. 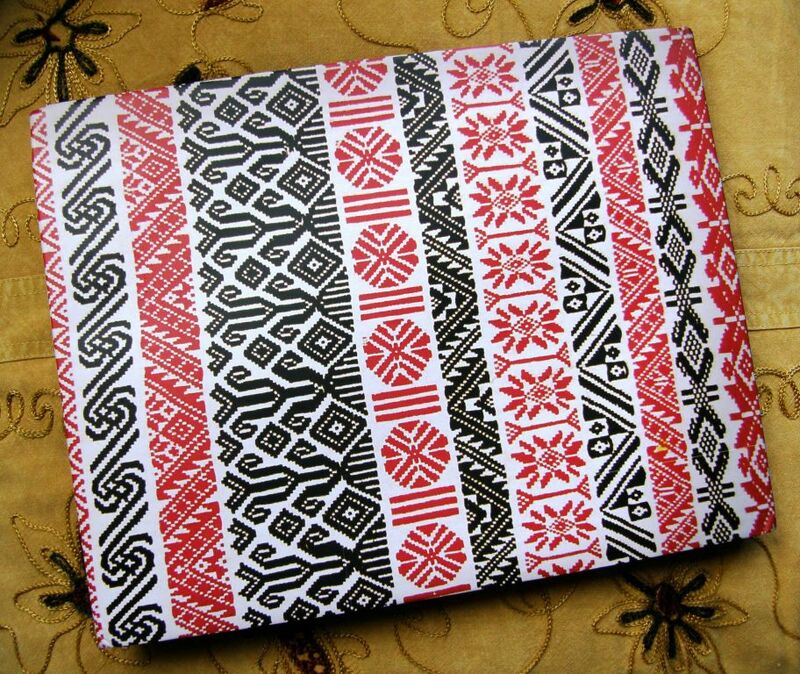 He managed to find the author, go to her house, where he said he enjoyed seeing her collection of tribal textiles, buy the book from her, tease me by posting a picture of it on Facebook and then send it to me! We were both very nervous about the mail as we both live in countries in the developing world where things often don’t work quite the way they should. Well, I have been blessed because here I have it in my hands and it is really lovely. I have only read the first few pages of Chapter Two which is about the Chakma weavers and it starts with a lovely story of how, in order to encourage the tribal backstrap weavers to start weaving again the traditional sampler known as alam as well as to see just how many of the 210 designs could be recovered, a competition was organized among twenty weavers to see who could produce the best example. And the story goes on from there telling about the preparation for the weaving, the loom, the process. I can’t wait to read more. How I wish I could hear this sung in its original language! Twelve chapters in the book deal with twelve different tribes and their work. One disappointment is that the index promises a bibliography on page 164 but my book ends at page 160! Too bad…I love bibliographies. 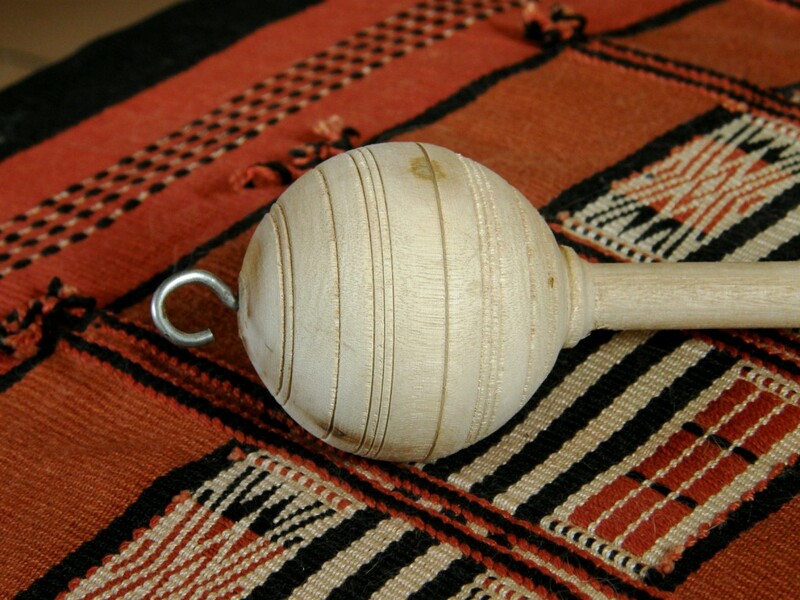 A friend of mine in Australia, Linda, went to Morocco last December and I asked her to get me a typical spindle. I have since decided to make this a gift for my friend Lisa in North Carolina. It isn’t for me anymore after my recent de-clutter campaign…books will always be welcome but I have enough spindles! I actually had no idea what a typical Moroccan spindle looked like and Linda is not a spinner and told me that she had quite a difficult time finding one in the markets. Eventually an elderly gentleman told her that, if she came back the next day, he would have one for her. Linda thinks that he had this specially made for her. I asked the ladies in the Spindle Lore group about this particular kind of spindle and got many helpful responses. 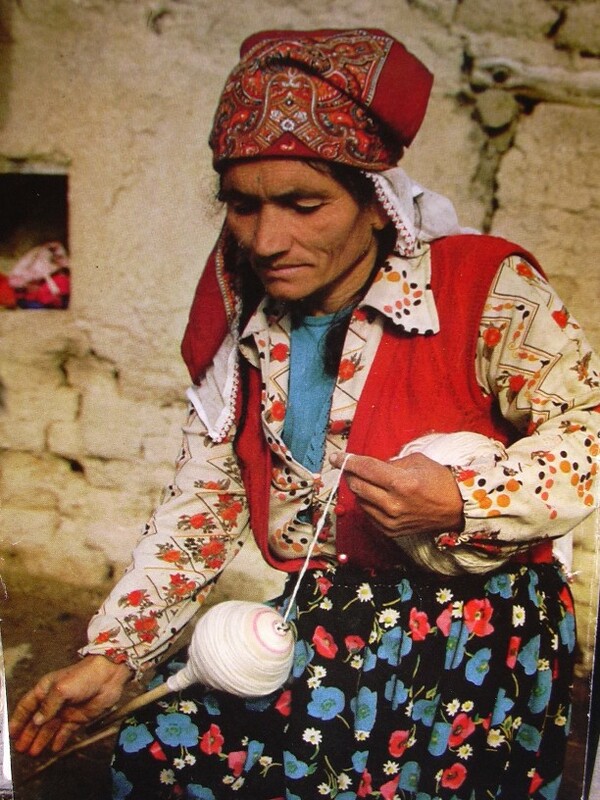 Tracy sent me a link to this site about Turkish tribal textiles which has this image of a woman using a very similar spindle. I know that Lisa will use and enjoy this spindle. If it stays here with me, it will be left hanging on the wall. I am happy to see it, handle it and take pictures of it and learn a bit about it in the process. 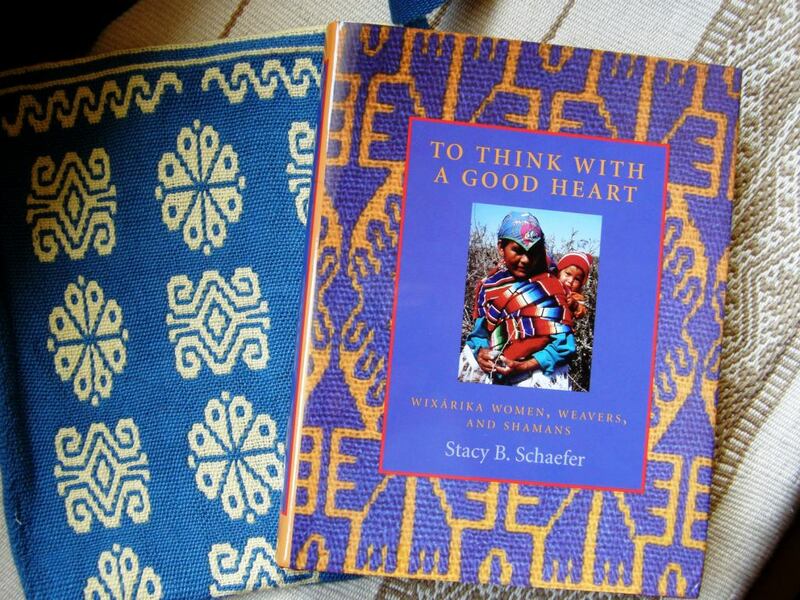 To Think With a Good Heart…Wixárika Women, Weavers and Shamans by Stacy B Schaefer came to me as a used copy from the UK (copies for under $3 are out there!) 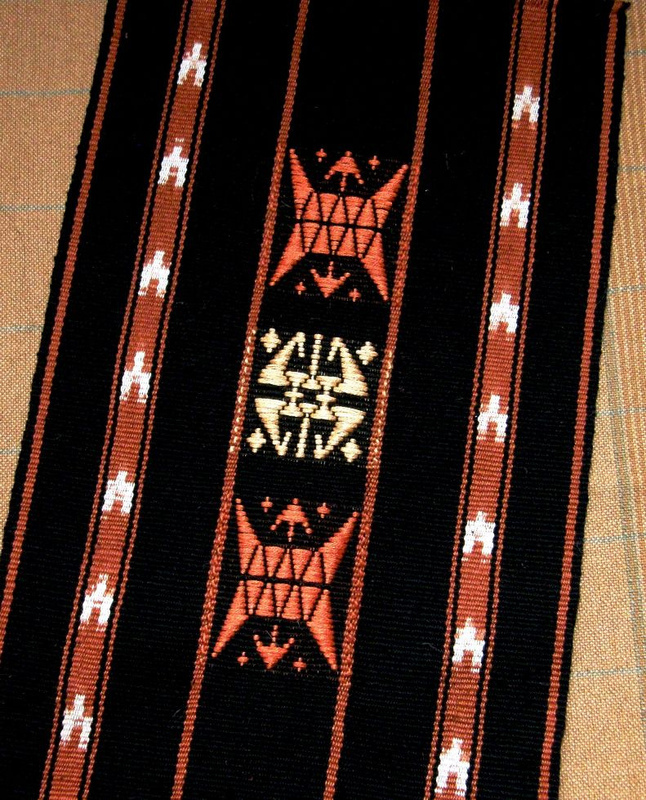 after having been recommended to me by Hopi weaver Luis Garcia. 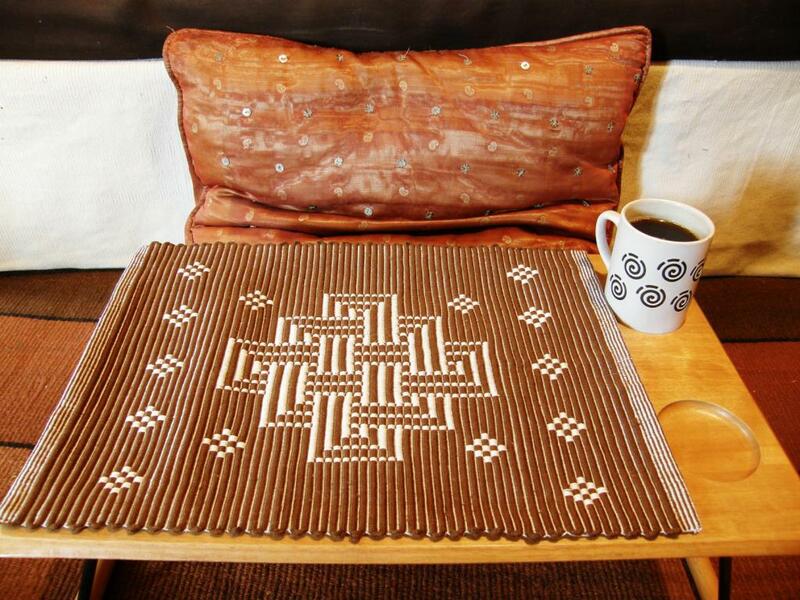 Luis and I met online through a mutual interest in Huichol, or Wixárika double weaving. Here is one of Luis’s pieces in progress. He is weaving almost exactly the same motif as I chose for my bag above. A woman’s weavings reflect the changes and transformations she undergoes as she follows her life’s path, and her rites of passage from childhood to adolescence and marriage are marked by her abilities as a weaver. 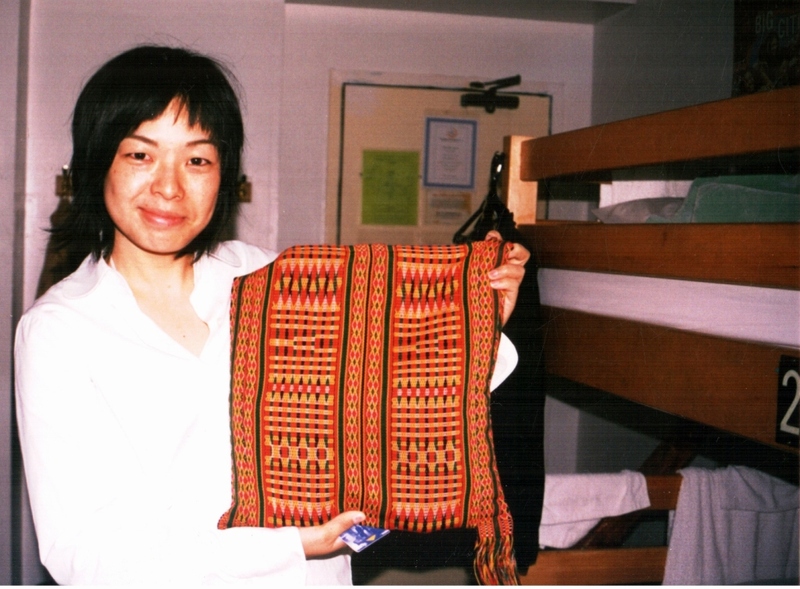 As a wife and mother, she is the provider of woven items for her family until she is physically no longer able to weave. But, never idle for long, she takes up spinning to help the younger women in the family carry on the weaving tradition. A woman’s life is so integrally tied to her identity as a weaver that she carries her loom to the grave, where it is buried with her. In this book, I hope to bring Wixarika women into visibility by focusing on the medium of loom weaving. I present a descriptive ethnography of Wixárika women’s lives in chapters organized in interconnected sections that discuss gender roles, the life cycle, economics, religion and cosmology. 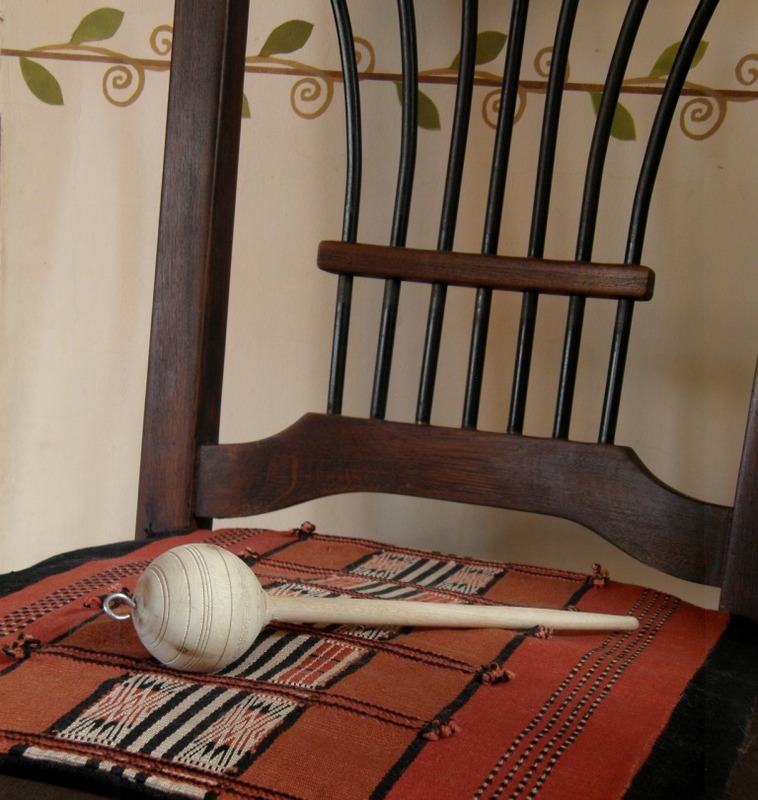 The book is the result of Schaefer’s having apprenticed with master weavers in two Wixárika families but it is not a how-to book. 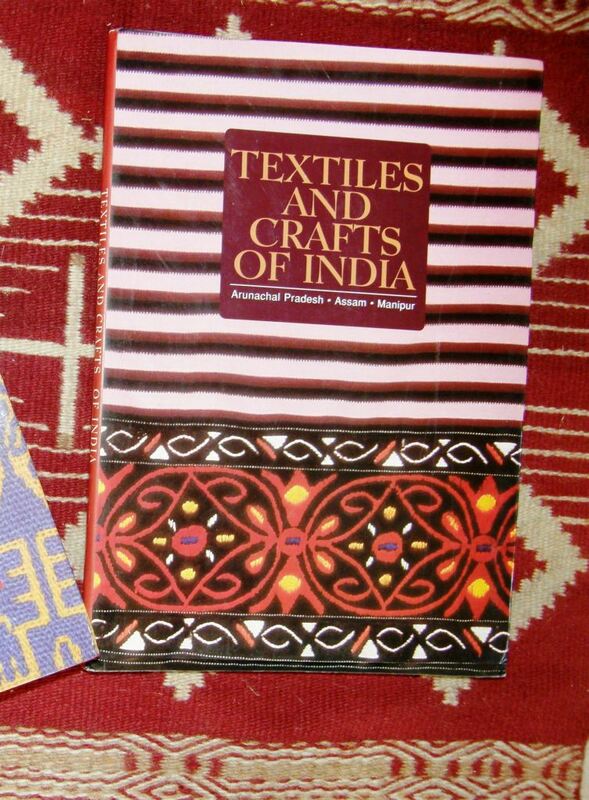 From India I received a book that was recommended by a weaving friend in Canada who just returned from a trip to the northern states of India. Beautiful pictures and plenty of luscious inspiration! One particular textile jogged my memory from back in 2007 of a bag that one of my Youth Hostel roomies in the Washington DC Youth Hostel had. She said that a friend in Sri Lanka had given it to her. What a great color scheme! I think I need to try something like this. 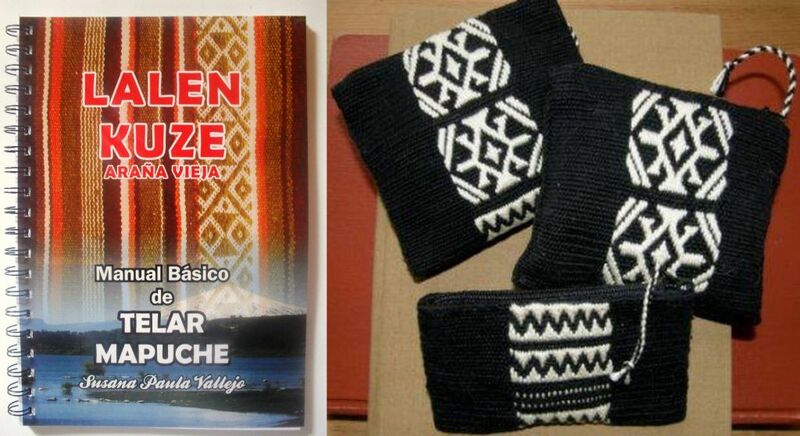 This is Susana Vallejo’s updated edition of her Manual Básico de Telar Mapuche. This revised edition has many more beautifully taken step-by-step photos than the original. 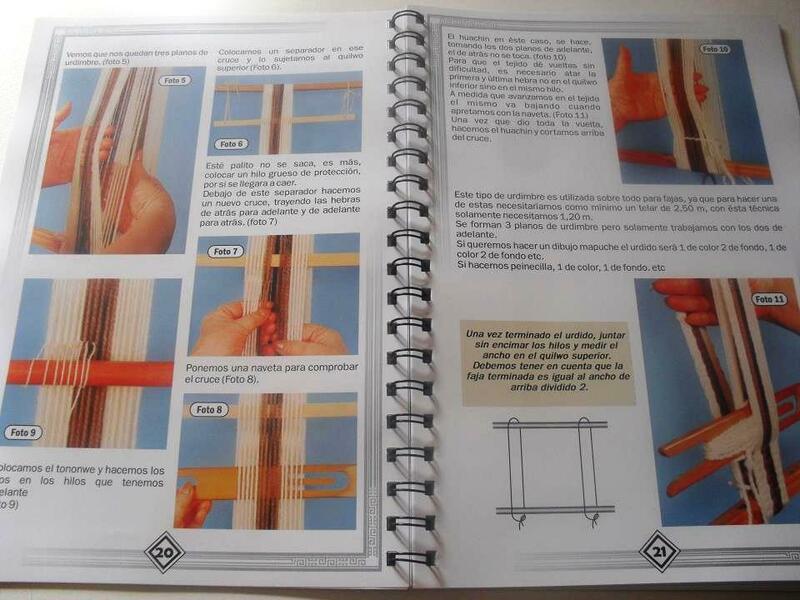 Susana and I are online weaving buddies and we swap our books and ideas. I first swapped my Andean Pebble Weave book for a copy of her first edition. I will send her a copy of my next book in exchange for this copy of hers. She lives in Mar del Plata, Argentina where she runs a very active weaving school and I find her always buzzing with energy and so wonderfully charming! 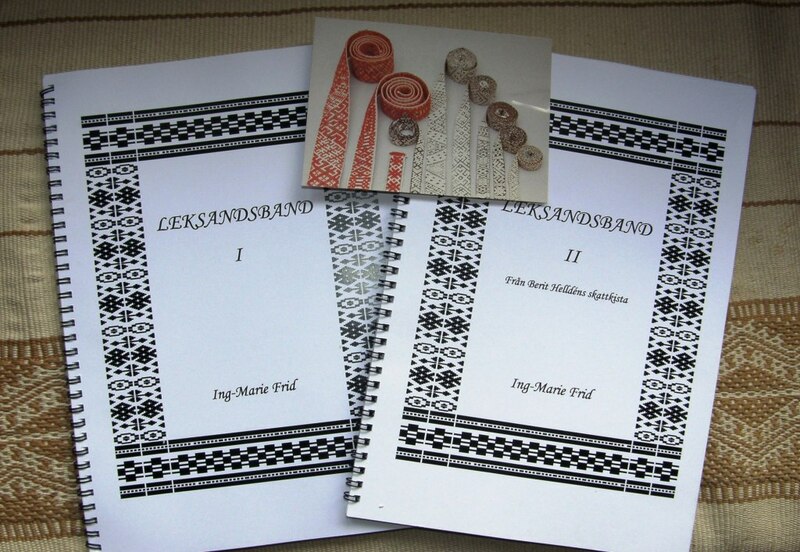 What a beautiful piece of work author Ing-Marie Frid has made with page after page of meticulously charted designs from these wonderful traditional bands. Photos of the original bands accompany every chart and they are simply stunning. It wasn’t all about opening packages and playing with all my gifts and purchases this week. I did some preparation for future weaving projects too. I am preparing a sample ikat warp putting into practice some thoughts and theories that I have on how to keep the threads better aligned. I am still not being terribly brave or adventurous about this and am using a simple diamond motif and keeping things small. I wrap the warps for one diamond a day, slowly and methodically while I think about different strategies for successfully weaving it. 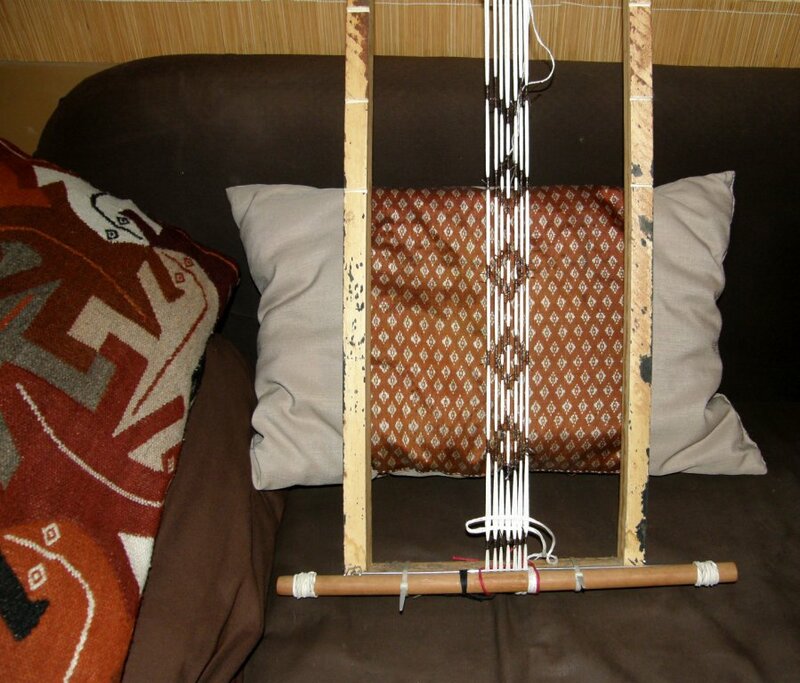 I have the warp set up on a frame for now as I wrap and here it is sitting in front of a silk piece, with a similar simple ikat pattern, from Cambodia. I am using cassette tape to wrap. The ikat is part of our new weave-along and we have Janet and Tracy so far wrapping away as well. The other preparation project which was really taking a long time to get off the ground was the charting for the continuation of my Wayuu inspired wall hanging. Well, dither no more, it is going and appears to be successful! 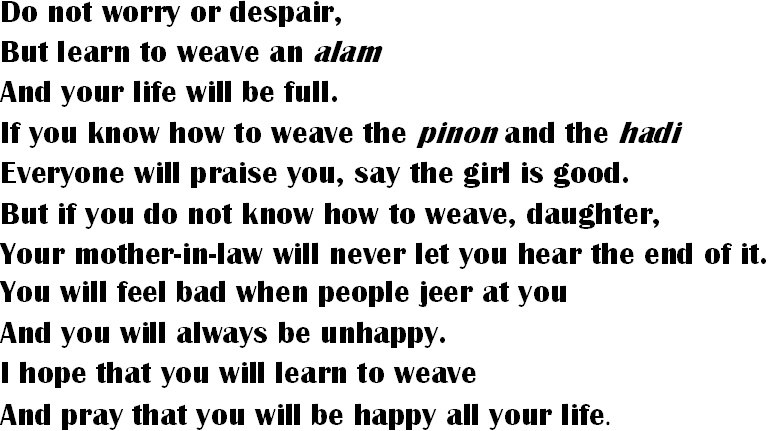 (although the proof will be in the weaving). 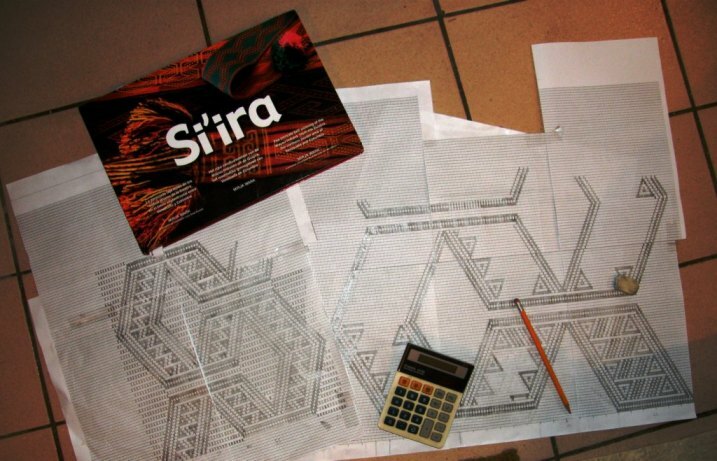 Mirja Wark has charted the traditional design in her book but it is not entirely symmetrical as that is the way the Wayuu weavers choose to weave it. I, however, have this need for symmetry and so I adapted and recharted it only to weave it and find it too small and delicate for my wall hanging and the thread I am using. Now I am changing it yet again to be big and bold enough for my piece. I kind of like the fact that I am changing it so much as there are now several pieces of “me” in the design! The rep weave sample came off the loom and got hemmed. I had some width issues so this definitely goes in the “sample” category. It fits my tray table perfectly though and will certainly be put to use to stop my bowls from sliding about. And then Jorge came and said that he preferred the other side…not terribly practical white side up… but now I can’t decide which side I prefer! Thank you Marijke for your card woven knot pattern! Bobbie, from the Ravelry group is weaving this lovely piece using that yummy Dylon Cold Water terrcaotta dye on her cotton. She is weaving one of the al’ouerjan variations. Yonat wove Bedouin Warp Substitution with me last fall and is weaving this band with many variations of the al’ouerjan pattern on her inkle loom. 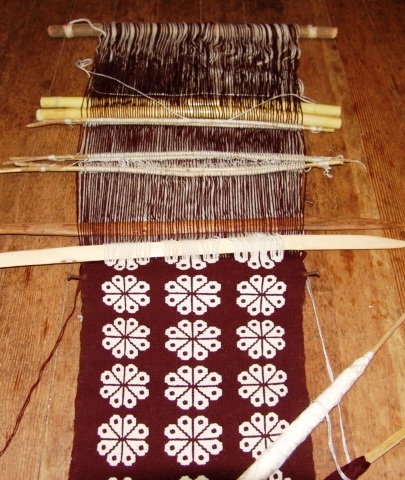 It is a sample band of the different patterns and she is practicing her weft twining along the way. She says that she is not crazy about the colors she chose but I love them! We have exciting news from Tracy Hudson in the backstrap group who lives in Doha Qatar. She has written an article on Bedouin spinning which will be in the spring issue of Spin Off. And that brings to me to wrapping this up with the unwrapping of the last “Christmas-comes-late” gift. My dear sister-in-law made me an amazing calendar with pictures of some of my weavings mixed in with Navajo and other bits and pieces that she saw on her recent trip to south-west USA. She didn’t have many pictures of my stuff to work with…just a handful of pictures I had sent to my brother for editing about two years ago but she did a tremendous job putting it all together. And, wise and clever woman that she is, she left January 2012 off the calendar and replaced it with January 2013 at the end knowing that I probably wouldn’t get this until February. I don’t get to see Deb and the family very often and am way overdue on a visit to Australia. She blew me away with this! Lucky, lucky you to have received these great books! They will provide lots of inspiration for years to come! wow, so many amazing presents… somebody is going to party for a while. 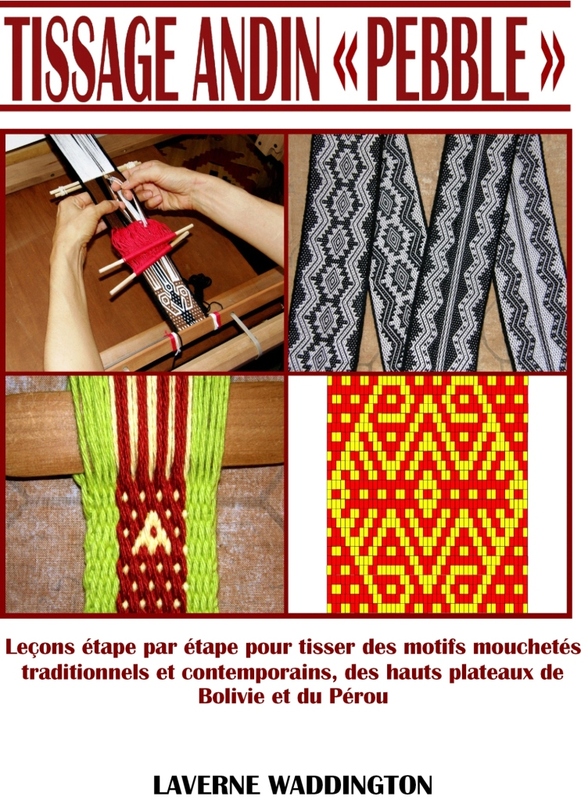 Just reading your blog and looking at all the amazing, amazing weaving is like Christmas! It is the best. You are certainly my weaving hero and inspiration! Where can i buy those books ? Wow, what interesting books and beytifull pictures. The books from Sweden I never had heard about, do you know where they sell them? I have asked Olle-Petter this very question, Louise. Hopefully I will have an answer for you next week. This is a lovely web you have Laverne! Thank you so much Maria for visiting the blog. I think there will be a lot of interest in your books. I love reading about all of the books and would love to add them to my library. Your emails always inspire me to get to work. Thank you for the pushes. I have emailed you with a lengthy reply Hilary, but the short answer is, sorry, but I won’t be able to do that.